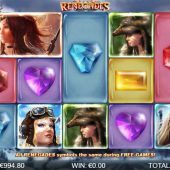 Renegades slot joins the esteemed collection of Nextgen trademark games such as Justice League and Judge Dredd, although despite appearances this is their own creation! Your theme is pretty much lady power as with Microgaming's Girls With Guns and there are five of them on the reels which spin over a frozen fantasy background scene to classical music which soon increases in dramatic tone as we spin and win. So we have a great-looking game and some dangerous-looking women, but will our balance escape their wrath? The first thing you'll notice is that the icons are stacked and can appear in 2x2 blocks as well as horizontal pairs which is helpful as we have a 243-way game over 5 reels of 3 rows each. The pays aren't huge given this format and 5 scatters is the best at 10x your 40-coin bet. The Renegade characters are Freya Valkyrie of Valhallah at 5x, Harriet Hellstorm at 3.75x, Valda Dragonslayer at 2.5x, Raffaela Blaze at 1.5x and this formidable quintuplet is completed by Ivy Sabreclaw at 1.25x bet for a 5-of-a-kind win. You do get stacked Wilds too paying 6.25x and the minor symbols are yellow, blue, orange, purple and red gems all paying 25 coins. Before we see the bonus there is one in-play random feature - on any spin 2 or 3 adjacent reels may lock together and display a mega 2x3 or 3x3 block symbol which can be lucrative given the 243-ways to win. 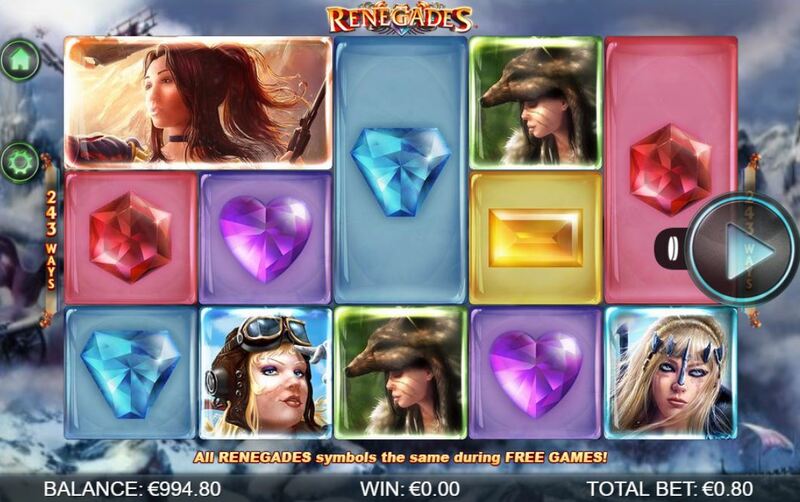 If you see 3 or more Ice Blue bonus scatters you will be awarded 8 free spins. You can retrigger them and naturally the random mega symbol event will occur more frequently but the main enhancement is the game choosing one of the 5 characters to be the only Renegade on the reels thus resulting in a higher likelihood of Renegade wins.